What percentage of atrial fibrillation (AF) patients with an ICD and congestive heart failure can be considered for catheter ablation? 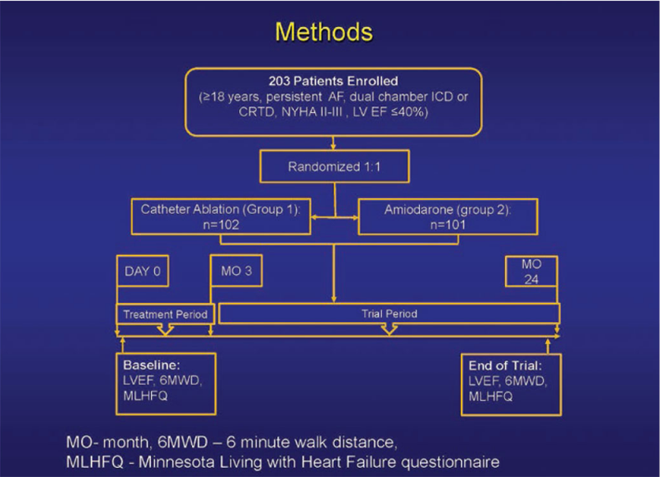 Long-term result of the multicenter Ablation vs Amiodarone for Treatment of Atrial Fibrillation in Patients with Congestive Heart Failure and an Implanted ICD/CRT-D (AATAC-AF) study, presented during the American College of Cardiology’s 64th Annual Scientific Sessions in March 2015 by Dr. Luigi Di Biase (Albert Einstein/Montefiore Hospital, New York) and colleagues, demonstrated that catheter ablation of persistent AF was superior to amiodarone in achieving freedom from AF at long-term follow-up as well as reducing hospitalization and mortality in patients with heart failure (HF). Unlike with many previous catheter ablation trials that enroll patients with preserved left ventricular (LV) systolic dysfunction. AF and HF frequently coexist and are often associated with several common predisposing risk factors. The prevalence of AF increases with HF severity (e.g., from 5% in functional class I patients to approximately 50% in class IV patients), and the prevalence of HF and AF can lead to deleterious hemodynamic and symptomatic consequences. In the randomized AATAC-AF study, 203 patients were enrolled and randomly assigned (1:1 ratio) to undergo catheter ablation (group 1, n=102) or receive amiodarone (group 2, n=101). Patients ≥18 years of age with persistent AF and a dual-chamber ICD or CRT-D, NYHA II-III, and LVEF ≤40% within the last six months were included in this trial. Results showed that 71 patients in group 1 vs 34 patients in group 2 were AF recurrence-free post treatment. Furthermore, of the 102 patients who underwent catheter ablation, a higher success rate was shown in the patients undergoing PVI plus (78.8%) compared to PVI alone (36.4%). At the end of follow-up, recurrence-free patients (n=105) also experienced significantly better improvement in all parameters compared to those who experienced recurrence (n=98). Over the 2-year follow-up, the hospitalization rate (31% vs 57%) and all-cause mortality (8% vs 18%) were lower in group 1. How Do Balloon Technologies Compare with New Generation RF Ablation Systems?